Seven Days writers can't possibly read, much less review, all the books that arrive in a steady stream by post, email and, in one memorable case, a swarm of boxelder bugs. So this monthly feature is our way of introducing you to a handful of books by Vermont authors. To do that, we contextualize each book just a little and quote a single representative sentence from, yes, page 32. Sue D. Burton, Two Sylvias Press, 86 pages. $16. My brain in a bramble, heart in a porcupine vest. The poems in Sue D. Burton's first book are delirious in the best way. Images of the woman in the magician's box dominate this collection. We see her trick in all its magic and mundanity as, having been seemingly sawn in half, she leaps out — alive, or maybe half dead. As Burton contemplates this absurd vessel, we are brought to contemplate our vessels, too. And to contemplate what is real about a poem: the person who wrote it, the one who reads it, or only the words? Burton demonstrates this twisty thinking when she inserts herself into the very first poem in the collection, "The Abortionist Goes to the Grocery Store." She says, "I am the one who winces at the title," signaling to her readers that she is here, reading with us. She is very much inside this box of a book, but, then again, she is not. Burton drives the paradox home in "The Woman Who Is Sawn in Half Is in Love With Oliver Sacks": "Is it better for me to love the Adrienne Rich who built / the poem, or the Adrienne Rich inside the poem?" These jumps from reality to unreality, paired with her muscular, jockeying language, makes for a delightfully dizzying read. Amy Carst, evolution of id, 270 pages. $16.99. Three months later, I was on a plane bound for Uganda with my ten-year-old daughter. 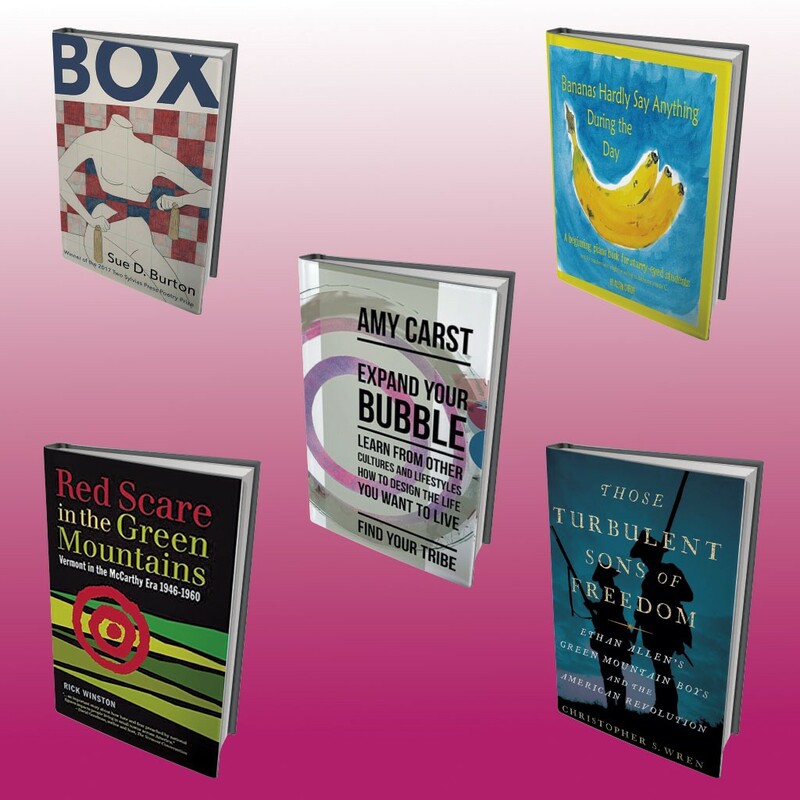 That journey is key to this combination of memoir, self-help book and anthology from central Vermont writer Amy Carst. Her thesis echoes a common theme of today's political pundits: Americans need to get outside their social media echo chambers and interact with a true diversity of "flesh and blood human beings." For Carst, we learn, that meant leaving the status-driven rat race and "embrac[ing] the black sheep within." When she visited Uganda's Malayaka House, an orphanage founded by American Robert Fleming, she found a sense of purpose — a "tribe." Putting her philosophy in practice, Carst fills her book with interviews whose subjects range from Arun Gandhi (author of The Gift of Anger) to a Vermont trans woman and her wife to a refugee from Laos to a Jordanian family man to a medium. While many of Carst's insights are familiar, her faith in the power of listening and understanding is inspiring. And she's putting her money where her mouth is by donating all proceeds from book sales to Malayaka House. Borgy wobbled and dipped ... yet he was still caught in Oob. In this piano instruction book, Barre concert pianist and teacher Alison Cheroff aims to appeal to beginners with short exercises on the scale and colorful watercolors. The book doesn't explain what bananas have to do with learning to play the piano, nor does it define its made-up words such as "Oob," "Elfsplight" and "Igs," but it's all in good fun. And it can't hurt to have fun when learning a complex instrument. In addition to the artwork and playful text, Cheroff, who has a website called the Pain-Free Pianist, imparts serious information: how to position the hands to avoid injury. Line drawings sprinkled throughout demonstrate just that. For more seasoned players who may experience keyboard-related tendonitis, that's music to the ears. All of us Vermonters who publicly worked for Henry Wallace were named in your columns as suspicious characters who ought to be deported to Moscow — or words to that effect. Archival research forms the backbone of this slim volume, which succinctly maps the most notable effects of the midcentury "Red Scare" on Vermont — and vice versa. A self-described "red diaper baby" who grew up in Yonkers, N.Y., Rick Winston moved to Adamant, Vt., in 1970. He describes Red Scare as the natural outgrowth of a conference he helped organize in Montpelier in 1998 called Vermont in the McCarthy Era. Though Winston suggests that Vermont was less rocked by the era's fear and scandals than other parts of America, he is quick to draw parallels between the 2016 and 1948 presidential campaigns of Bernie Sanders and Henry Wallace, respectively. Finding further timely parallels, Winston points out that Donald Trump's "mentor in public life was Roy Cohn, Joseph McCarthy's indispensable aide." He continues, "We have a president who is quick to use the words 'McCarthyism' and 'witch hunt,' but who himself uses the weapons deployed by the 'witch-hunters.'" Overall, Red Scare crafts a useful bridge between the past and present politics of sensationalism, one that might prove particularly rewarding to newshounds and political history buffs with Vermont ties. Christopher S. Wren, Simon & Schuster, 320 pages. $26. Ethan [Allen] might be fun for a night's carousal, but Seth [Warner] could be trusted to make the right decisions when stakes turned deadly. Reading Christopher S. Wren's concise, action-packed history of Vermont's role in the American Revolution, I found myself wondering, If Quentin Tarantino made an Ethan Allen bio, whom would he cast? You might not find the notion so off-the-wall after reading Wren's accounts of the scrapes the Green Mountain Boys routinely invited and endured. Take an early scene in which Allen's cousin Remember Baker defends his homestead from New Yorkers: He "jumped up naked from his bed and fought back with his axe ... A swinging cutlass hacked off his thumb." Then there's Allen himself, a braggart and "reckless military strategist" who "sparkle[d] as a propagandist," constantly putting the spin on his own legend. Wren isn't the first to demystify Vermont's favorite war hero; among the sources he cites is Inventing Ethan Allen (2014), by John J. Duffy and H. Nicholas Muller III, which covers much of the same ground. But the New York Times veteran gives his history a freewheeling energy that makes this tale of Vermont's own indomitable "inglourious basterds" a highly accessible read. The original print version of this article was headlined "Short Takes on Five Vermont Books"
Sadie Williams covered art for Seven Days from 2015 to 2018.